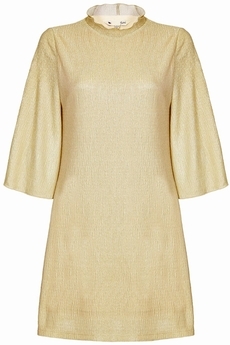 Yumi London Sparkly Zip Front dress will add some sparlke to your look. In A-linee style, made of jersey fabric with elastication, adorned with shimmering thread for an eye-catching finish. This easy-to-wear style has double round collar neckline, wide ¾ length sleeves and A-line loose fitting shape. It simply slips on and is approx. 88cm in length. Winter collection. Composition: 95% Polyester, 5% Elastane. Color: Black.